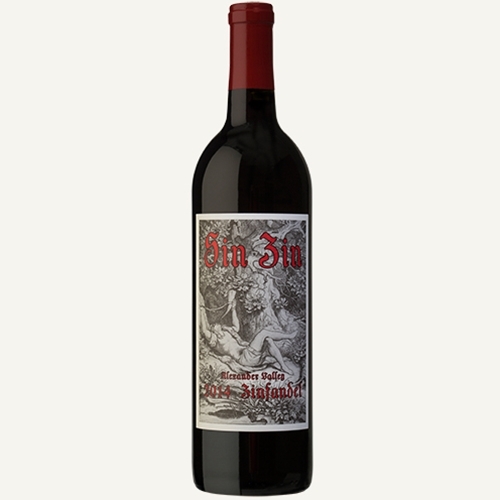 Spicy, jammy, seductive - Sin Zin is the original California classic! The Sin Zin label was one of the first whimsical labels approved by the ATF and at the time was considered rather risque'. When tasting samples of the first vintage, the family wanted to find an image that matched the lush flavors. Leafing through an old art history book, then Assistant Winemaker Dennis Hill came upon a captivating illustration, a seventeeth-century German etching, completed by Moritz von Schwind c. 1840 titled "Des Knabben Wunderhorn", meaning "The Horn of Plenty". The image looked perfect for a wine label, and its bacchanalian character inspired Co-Owner Katie Wetzel Murphy to name our rich lush wine - Sin Zin. The label was used on the first vintage in 1978 and the wine was given to friends and family.